When I was 13 years old and attending a friend's Bat Mitzvah, my friends and I were trying to request the song "Jack and Diane" by John Cougar Mellencamp, but the DJ informed us that he would only accept written requests. (I suspect he just didn't want to play the song.) None of us had a pen, so we found ourselves trying to spell out the interminable number of letters in "Mellencamp" with cheese dip on a cocktail napkin. In that moment, I made the lifelong resolution to become the sort of person who always has a pen on me. While hearing a favorite song at a party could hardly be considered an emergency, this frustrating experience began my quest to always have the tool I might need in jam. And like the pen I always carry, the following eight items don't take up a great deal of room, and they just might help someone out in a crisis. It's smart to always have a source of water with you in case of emergency. The most obvious emergency you might encounter is thirst or heat stroke. However, a water bottle can also offer the ability to clean a wound, sterilize equipment (if you're able to boil the water), or clean off the dirt-encrusted windows in the house you are holed up in during the zombie apocalypse so that you can see what's coming before it arrives. Aunt Flo is not always predictable, so it's a good idea to keep some pads or tampons on hand in case she decides to visit at the most inconvenient of times. Safety pins have a number of other important uses, from keeping hotel room curtains fully closed to securing keys in your pocket (if you're about to ride roller coasters or worry about pickpockets), to eliminating static cling. So in the event of pretty much anything out of the ordinary, a safety pin can fix the problem. While nearly everyone is carrying a portable light source in the form of a smartphone these days, it's still a good idea to have a dedicated flashlight available. For one thing, what happens if it's your phone that you need to search for under a car at night? Gone are the days when everyone needed a lighter for cigarettes, and letting the cover band know just how much they are enjoying "Free Bird." However, a lighter is still a useful tool to carry with you at all times. 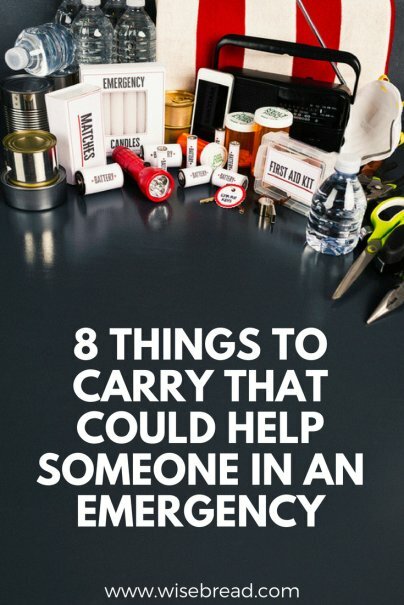 If you are in an emergency, having a lighter means you can more easily sterilize needles, light candles and torches, and of course, start a fire for warmth and to cook food. In general, you probably won't need most of the items on this list on a day-to-day basis. But you never know when you'll have to deal with a power outage, a medical emergency, a wardrobe malfunction, or a reluctant DJ — and when you do, you'll be glad you have the necessary tool to deal with the problem.